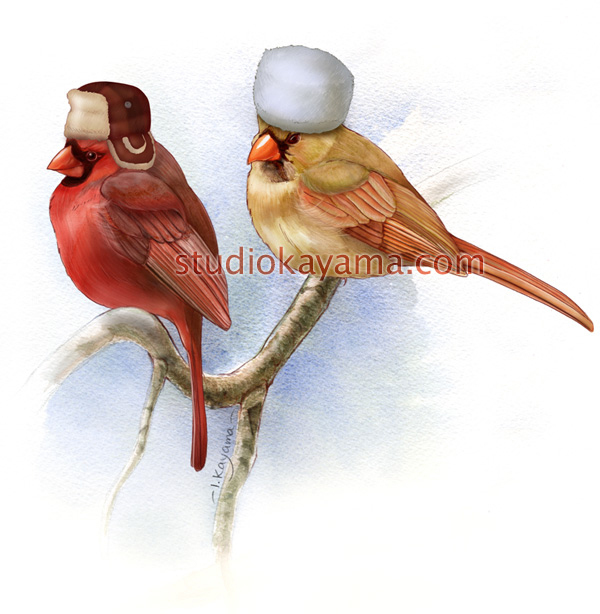 This scientific illustration depicts a pair of northern cardinals for identification purposes for a field guide or a nature park sign – but with hats! Northern cardinals are one of the most common species of birds spotted in the backyard. They are easily identified by their distinct crest and bright coloring. Males are bright red, and the female is olive green. The cardinals are monogamous and remain together the whole year. One is frequently seen calling and listening for the other. The northern cardinal is the most popular state bird in the United States. When illustrating birds, I always make sure to get the overall shape and beak characteristics correct first. I usually go on birding trips for native birds to study them in life and see how they carry their bodies and interact with one another. Each species seem to have their own “personal poses”! It is amazing to find so much variation in color and plumage even in the same species, so I average out the characteristics to prepare the final plate.